Founded in 1945 the NASC membership now accounts for a significant share of the UK’s total industry workload and is increasingly making its mark in Europe. Our contracting members operate from locations throughout the UK, and our non-contracting members, and information members operate throughout the UK and beyond. NASC members are strictly audited – ensuring the highest possible standards are met, confirming to our NASC Criteria, Code of Conduct and the Code of Practice for scaffolding products. It’s these high standards of our members’ access solutions that are recognised by construction industry leaders, who continue to stipulate NASC-only companies for access and scaffolding. Major principal contractors, housebuilders and local authorities are increasingly specifying members of the NASC only when sourcing scaffolding contractors. Ahead of the NASC’s 2018 AGM – held in Edinburgh in November – a number of these organisations were invited to explain the reasons behind this procurement decision. Click the video below for more. A full listing of NASC Members can also be found in the annual Yearbook (available in pdf by clicking on the image above). This book is available free upon request, subject to stock availability and can also be viewed from the following link. The NASC operates a strict policy of full compliance to all new legislation and its own code of conduct. This separates us from the rest of the industry. Through our annual membership audit we ensure that our members uphold best practice as professionals. This means we do not look for shortcuts on safety, which could put lives at risk. Few trade associations can claim to have achieved so much in such a short time. The NASC – The National Access & Scaffolding Confederation has been the established national representative employers organisation for the UK Access and Scaffolding Industry for more than 60 years. In recent years the NASC has become a highly visible and vocal body on all major issues, and more representative of the industry as a whole. 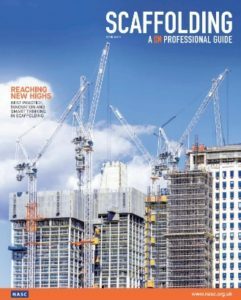 For many, both within the construction industry and the media, the NASC is now one of the leading trade associations. All NASC members are required to abide by a strict code of conduct, which sets trading standards for the industry and which also requires them to provide the highest possible service. Many members of the Confederation offer a full service for larger and more complex structures and all members provide detailed calculations and working drawings, as well as on-site advice. Access and Scaffolding is an important part of most contracts. Specifiers and contractors need the quality of service only NASC members can provide. Anything else is an unacceptable compromise. Consequently, many public and private organisations and an increasing number of local authorities are now specifying that the scaffolding contractors they employ must be members of the NASC. The development and maintaining of best practice not only involves dialogue with our members but also includes regular consultation with some of the most important and influential organisations in the construction sector. The NASC works regularly with a number of other organisations to strive for best practice and development in scaffolding that will remain in line with other construction industry stakeholder initiatives. Indeed many representatives from these organisations are permanent members of the NASC standing committees focusing on particular areas of best practice, for example Health and Safety or Technical issues. The NASC are also members of TAF (Trade Association Forum). All NASC guidance and publications are in line with the latest developments in construction and building and are regularly reviewed and reissued to maintain up to date. The regulated scaffolding industry of today is a professional specialist industry with very high standards of workmanship. Please watch this short and informative video produced by the UK Power Networks. And click here to view their scaffolding safety leaflet. As a requirement of their membership NASC members must abide by the following Code of Conduct.